It should not be a surprise to anyone that the City of Muscatine has, as one of their goals, the development of placemaking projects that will maintain local amenities for residents while also attracting and retaining a quality workforce. The placemaking philosophy, an idea that changes the emphasis of urban design from automobile traffic to pedestrian traffic, guides the public and private sectors of Muscatine in the development of plans for the riverfront, the downtown area, and the community as a whole. Walkability is not a new concept, just one that ran up against the rise of the automobile in the 20th century. Urban development patterns also changed more affordable cards made driveability more important than walkability. Driveability also had a hand in families moving out of the older, more established, and walkable cities and into suburbs that featured stretches of single family homes surrounded by green space where the family could live while driving to work, to school, to shop, or do just about any errand they might have on their to-do list. That trend began to change as we moved into the 21st century. The City of Muscatine and other visionaries saw this change develop and created long-range goals that would return the concept of placemaking and walkability to the forefront of discussions for all future infrastructure and other city projects. 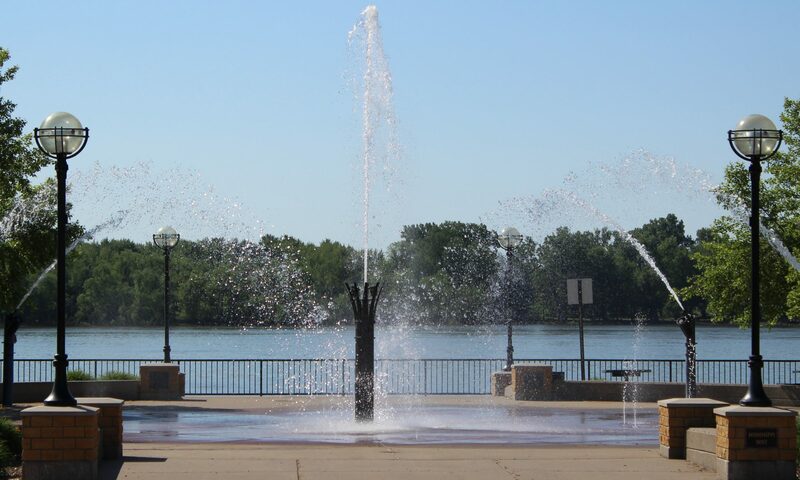 The creation of Riverfront Park was one of the first steps to creating these people friendly venues along with the development of walkable trails, the Complete Street policy, and the revitalization efforts for the downtown business district. One of the great assets of Muscatine is Riverfront Park with its green space, public areas that invite social interaction, and the walking and bike trails that can take you to Weed Park in one direction and will eventually lead to Deep Lakes Park in the other direction. The reconstruction of Cedar, Colorado, Mulberry, and now Mississippi Drive are all part the efforts by the City to make Muscatine safer and more user-friendly for walkers, joggers, bicycle enthusiasts, and citizens of all ages. In the future the concepts of placemaking and walkability will be extended into the downtown area as the sidewalks and landscape along 2nd Street are reshaped to create a more pedestrian friendly environment. The effort to revitalize the downtown business district is based on several studies which suggest that neighborhoods that mix small shops and restaurants with residential availability are prone to economic growth. That means the spirit of entrepreneurship that is well established in Muscatine can continue to grow and prosper as more money is spent locally and more jobs are created. It also helps the environment. Between the continued development of Riverfront Park and the 2nd Street project in the next year or two, is the Mississippi Drive Reconstruction Project which officially begins on Monday, May 8. If you have not yet had an opportunity to view the plans for the redesigned automobile traffic pattern along the riverfront you owe it to yourself to do so at your earliest convenience . That opportunity just happens to be Tuesday, May 2, at the Riverview Center from 5:30-7:30 p.m. The use of landscaping and modern traffic design to create a balance between the necessities of automotive traffic and pedestrian traffic will be a huge benefit to the entire community. The design elements being implemented on Mississippi Drive will be used in other projects slated to begin in the next several years. And the use of Mississippi Drive as a connection between the river front and the downtown business district will yield plenty of economic benefits as well. We will continue to look at the placemaking ideas and the use of walkable neighborhoods in future blog posts.